Discussing the legacy of Johannesburg’s gold mining. Francis Hodgson and Jason Larkin. Larkin was last at the Frontline Club in 2011 to present a project he had worked on with Jack Shenker – Cairo Divided. His new project shows the same measured, thoughtful and thought-provoking approach – a series of beautiful, square-format images, which present a subject but do not force one conclusion. And as such Larkin presents the images of a legacy – and encourages us to question how we will engage with that legacy today and in the future. As well as addressing how a photographer communicates ideas and reaches audiences, Larkin and Hodgson touched on the current culture of rapid consumption and disposal of images – the “digital soup” in which work can be lost. Asked about his influences, Larkin mentioned Simon Norfolk‘s work in Afghanistan as being able to convey more than standard, gritty reportage in a very beautiful way. 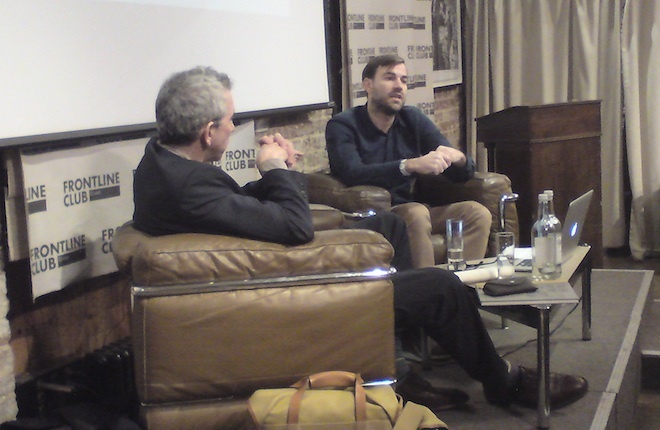 Went to the @frontlineclub to see @mrjasonlarkin talk about his photo/journalism project on mining in Johannesburg. Honest and inspiring. An exhibition of the work will be held at Flowers, 82 Kingsland Road, London E2 8DP, 20 February – 20 March 2014.